I have been knitting, a fair amount actually, but I am in gift knitting mode and thus don't have much to show on the blog. 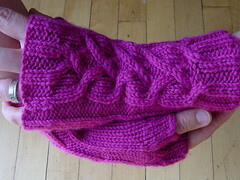 (If you are curious to know what I am working on, I am keeping up with my project info on Ravelry). This past Monday was almost unbearable at work in my library. The heat for the school gets turned off for the weekend, and it takes a bit for the building (especially a big space like the library) to warm up again. I decided I needed to do something before the next Monday (tomorrow), and I took a break from my various other projects, and knit up a pair of Evangeline Mitts for myself. 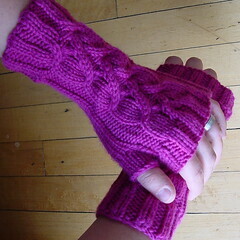 I'm in love with these mitts. I did not even want to wash/block them, because I started wearing them right off the needles and didn't want to lose any "wearing time" due to dampness. I am glad that I did decide to soak them - I think it made the cable pattern fill out just a bit more. They were still a bit damp for photos, but I think they will be dry and ready to go to work with me tomorrow morning. These knit up so quickly. The only mod I made to the pattern was to add one extra cable repeat to the "short" version for a total of 4 instead of 3. I really like the look of the longer version, but I think much longer than this would annoy me from a practical standpoint - most likely I would always be wearing them with something long-sleeved. 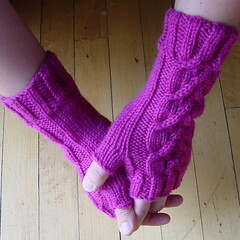 If I made them again, I might create a thumb gusset instead of just the thumb opening. They fit fine, but it does pull a bit across the palm, and I did some work on the inside to minimize the look of holes at the sides of where the thumb joins. Here's hoping it's chilly again at work tomorrow. Do you sell those?!! I see some gift giving potential - they are so pretty! 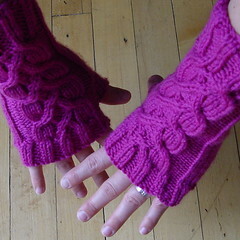 These Evangeline warmers are so beautiful! I'm floored by how many people have knitted your famous Gloria Cowl. It's a classic. 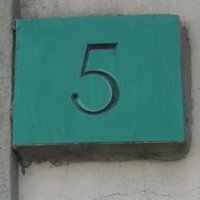 Three Years for the Budlet!